This is an almost complete set, except for 12 cents. 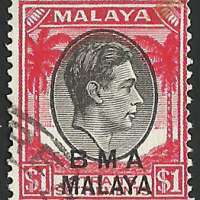 All of these stamps are put together and considered as one block of collection. 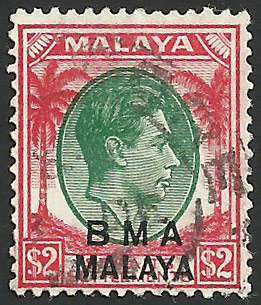 The British Military Administration (BMA) was the interim administrator of British Malaya between the end of World War II and the establishment of the Malayan Union in 1946. Specifically, the entity lasted from September 1945 to April 1946. 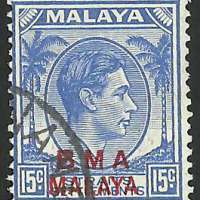 The Federated Malay States, the Unfederated Malay States as well as the Straits Settlement including Singapore were placed under temporary British military rule. 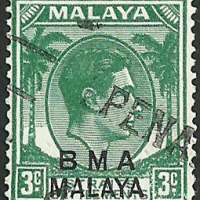 In September 1945, after the Japanese had surrendered, and the British returned to Malaya, all Japanese issued stamps were invalidated. 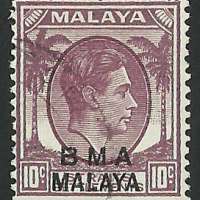 The free post period of one month enabled the British Military Administration to restart the postal service before the arrival of the BMA stamps. By Proclamation No. 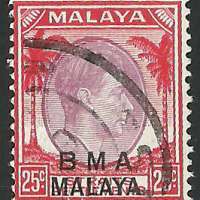 1 (1945), the Supreme Allied Commander of Southeast Asia established the British Military Administration which assumed full judicial, legislative, executive and administrative powers and responsibilities and conclusive jurisdiction over all persons and property throughout such areas of Malaya. The Proclamation also declared that all laws and customs existing immediately prior to the Japanese Occupation would be respected, except that such of the existing law as the Chief Civil Affairs Officer considered practicable to administer during the period of military administration. Otherwise, all proclamations and legislative enactments of whatever kind issued by or under the authority of the Japanese Military Administration ceased to have effect. 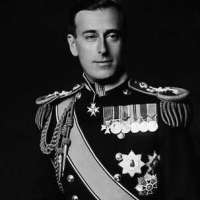 Lord Louis Mountbatten became the director of the administration in September 1945. Major-General Ralph Hone was given the post of Chief Civil Affairs Officer responsible for the Peninsula. Other professional soldiers and former European civil servants who had joined the army during the war comprised the government as well. During the same time, Singapore became the headquarters of the British Governor General in Southeast Asia. 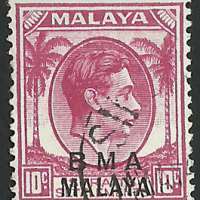 On April 1 1946, the BMA was dissolved and was replaced with a confederation named Malayan Union. Singapore however was separated from the confederation by the British and made a crown colony by its own right. 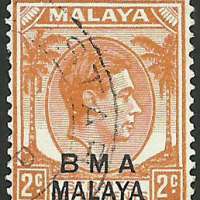 Original stamp were issued between 1937-1941, portrait of King George VI. Typography printing by De La Rue with 14 perforations. 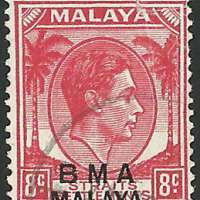 The Director of Posts was ashore at Singapore on 6 September and had reached Kuala Lumpur by 13 September. 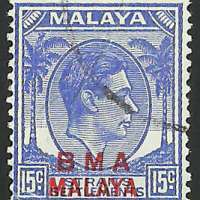 Postal services in Singapore and Johore resumed on 17 September and had spread to the remainder of the country by 5 October. No stamps were initially available so all mail up to 1 oz. 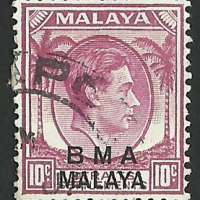 was carried free for local and overseas addresses until the overprinted stamps appeared on 19 October. 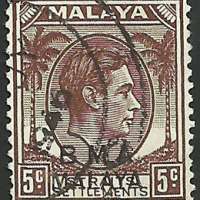 Straits Settlements stamps where overprinted by Government Printing Office in Kuala Lumpur, using plate made by De La Rue sent by Crown Agent. 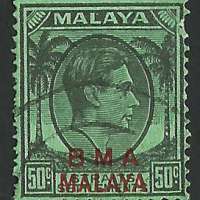 Overprinting of surviving local stocks took place for the 1 cent, 5 cents, 10 cents, 15 cents (overprinted in black) and $5 green and red on emerald. 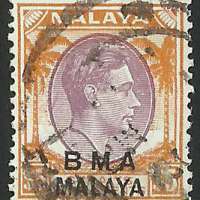 Malayan printing often show tropicalisation of the gum arabic, from being kept for more than 3½ in the tropical climate. 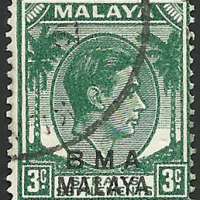 Plate was also sent to Australia banknote printing branch of the Australian National Bank in Fitzroy, Melbourne to overprint stamp which had been off loaded in 1942 by ships unable to dock in occupied ports in Malaya and Singapore. Diverted cargoes landed in Sydney and Melbourne were kept under custom controls until released three years later. For stamps printed pre-war and undelivered stocks, De La Rue was charged to use third plate to overprint in June 1945. 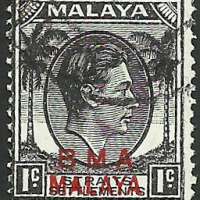 These stamps arrived in Singapore even before locally overprinted stamps became available. Initial supplies of the first six values were on sale from 19 October 1945 (No 1, 2a, 4, 6a, 7 and 8a). 15 cents and 25 cents (No 11 and 13a) were issued later. A second consignment contained dollar values including the $5 purple and orange. 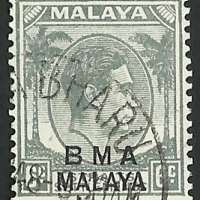 Between 1945 to 1950, approximately 240 million overprints took place where 8,418,141 were in Kuala Lumpur for stocks found in Kuala Lumpur and India while 9,698,200 were in Australia.